1. Preheat the grill for medium heat. 2. In a shallow bowl, mix the mustard, honey, mayonnaise, and steak sauce. Set aside a small amount of honey mustard sauce for basting, and dip the chicken into the remaining sauce to coat. 3. Lightly oil the grill grate. 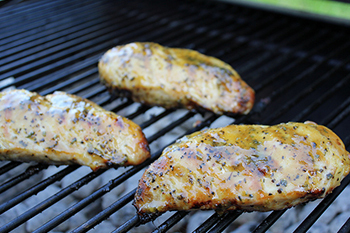 Grill chicken over indirect heat for 18 to 20 minutes, turning occasionally, or until juices run clear. Baste occasionally with the reserved sauce during the last 10 minutes. Watch carefully to prevent burning! 1. In a large resealable plastic bag, mix the teriyaki sauce, honey, garlic powder, and ginger. Place red bell peppers, onion wedges, mushrooms, beef and chicken in the bag with the marinade. Seal, and refrigerate 4 to 24 hours. 2. Preheat grill for medium-high heat. 3. Discard marinate, and thread the meat and vegetables onto skewers, leaving a small space between each item. 4. Lightly oil the grill grate. Grill skewers for 10 minutes, turning as needed, or until meat is cooked through and vegetables are tender. 1. Preheat and outdoor grill for high heat, and lightly oil the grate. 2. Place pizza dough in a bowl to rise 2 to 3 times the original size, about 1 hour. Flour a work surface and a rolling pin. Divide dough in half; roll each half to a 10- to 12-inch diameter circle. 3. Place pizza dough rounds on the preheated grill using a wooden paddle (pizza peel) and close lid; cook until grill marks appear on the bottom of each round, 3 to 5 minutes. Remove from grill and flip over on a work surface. Lower grill heat to medium. 4. Brush each round with olive oil. 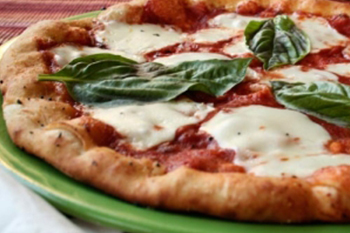 Spread half the Asiago cheese on each crust; add tomatoes, basil, and mozzarella. Season with salt and pepper. 5. Transfer pizzas to grill with wooden paddle and close lid. Cook until bottom of rounds is cooked with grill marks and cheese is melted, 7 to 10 minutes. Remove from grill and let stand for 5 minutes before serving. 1. Bring a large pot of water to a boil. Add potatoes, and cook for about 10 minutes, or until tender. Drain, and set aside to cool. 2. Meanwhile, in a large bowl, stir together the salad dressing, mayonnaise, green onions, dill, mustard, lemon juice, and pepper. When the potatoes are cooled, stir into the bowl until coated. Refrigerate for a couple of hours to blend flavors before serving. 2. Grill corn until hot and lightly charred all over, 7 to 10 minutes, depending on the temperature of the grill. Roll the ears in melted butter, then spread evenly with mayonnaise. Sprinkle with cotija cheese and serve with a lime wedge. 1. Preheat and outdoor grill for high heat. 2. Peel the onion. Slice into 6 to 8 wedges, leaving the base of the onion intact. Pull apart wedges slightly, and place butter, garlic salt, and ground black pepper inside onion. 3. Wrap onion tightly with aluminum foil. Place on the preheated grill. Cook 45 minutes, or until the onion is translucent and lightly browned. 1. Preheat grill for medium heat and lightly oil the grate. 2. Whisk olive oil, basil, thyme, salt, and pepper together in a bowl. Allow flavors to combine for 5 minutes. Brush oil mixture on inside flesh of peach halves. 3. 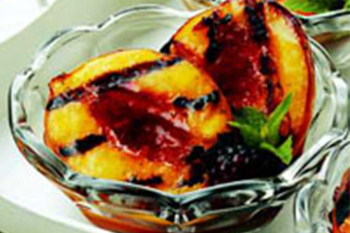 Grill peaches, flesh sides down until softened and grill marks appear, about 4 minutes. From concept to completion, we are there with you every step of the way. Our experienced designers will guide you through the thousands of options available to make your backyard environment fit your lifestyle.